The Learning Management System (LMS) has been constantly evolving over the past twenty years. Originally, the focus was always on features such as user management, reporting, and course capabilities. 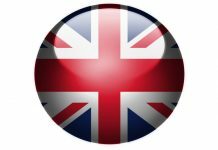 However, a focus on features fails to address one of the most important aspects of any system: usability. 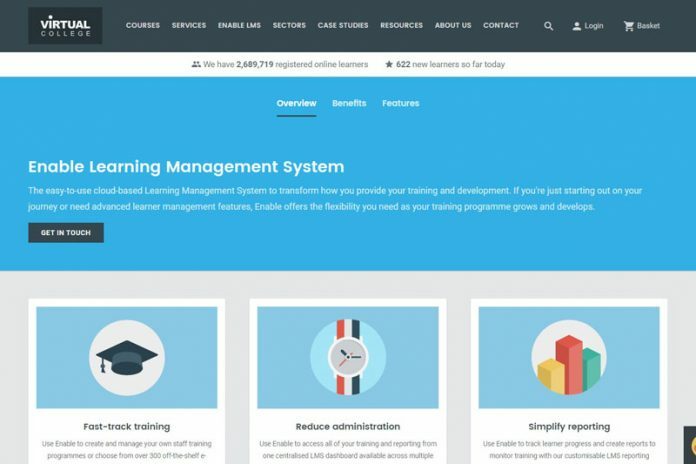 An organisation uses an LMS to train its learners, and so an LMS is only useful to an organisation if it is used by a significant number of learners. For a significant number of learners to use an online learning platform, you need an easy to use LMS – learners who find it difficult to use will immediately switch off. Learning Light believes that the most immediate and important aspect of usability is the User Interface (UI). The LMS UI is something that, with the new Enable, Virtual College have perfected. 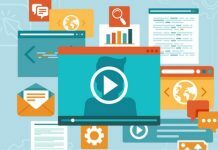 It is something that was originally brushed aside in the LMS evolution race, but elearning companies have now realised its importance – and Enable is in first place. The User Interface of an LMS is how the learner interacts with the system. Icons, buttons, menus, search bars, welcome screens and newsfeeds are just a few examples of the components that make up the user interface of modern systems. For LMS design to provide an effective learning experience, a learner’s interaction with the system should be straight forward so that this interaction doesn’t become a barrier to the learner’s learning activities. A user interface should therefore be simple, attractive and intuitive. The mark of a good LMS UI is the elimination of any superfluous actions which the user must perform in order to interact with the LMS. Enable’s UI is simple because every call to action – such as navigating between pages and performing actions – is featured in the same place on each screen, and is always displayed as an arrow button which is invitingly clickable. This means that once a learner knows how to perform one action, they can perform every action: learner-system interaction made simple. It is much easier for a learner who is looking for immediate information and learning in their LMS to find it if the screens they are presented with are not cluttered with unnecessary information and graphics. This has historically been a downfall of many LMS, whose pages were poorly laid out and designed. Each page of the Enable LMS design has been specially crafted to present the user with a highly consistent and simple layout. As each page features a similar layout, a learner can quickly and easily digest the new information which is presented to them on each page. The use of colours and metaphors within each page further focuses learner attention, and effectively focuses the learner’s attention on learning. Enable’s new user interface is elegant and attractive. This helps draw the user towards desired actions and learning activities, and makes the platform more appealing to use, increasing learner uptake. Its aesthetic elegance echoes the simplicity of its design, forming a cohesion of style and substance which enables learners to immediately begin using, and start learning with, the Enable LMS. The use of colour within Enable is striking and effective. 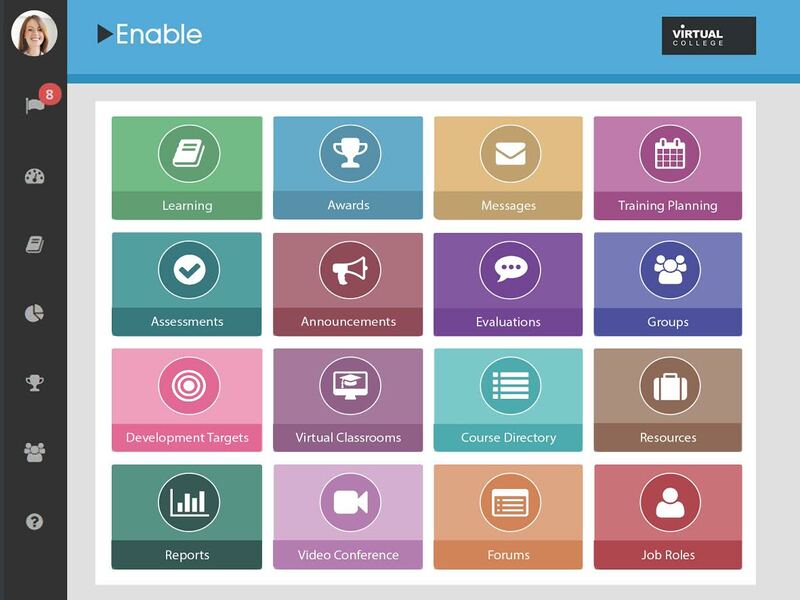 By using bold, distinct colours and tiles on each screen – and using consistent colouring to highlight areas with similar themes and functions – Virtual College have greatly reduced the time that it takes a learner to understand the layout of their learning management system. The appearance of Enable is one of its UI’s strongest points. A simple and elegant design has eliminated the amount of time a learner must spend getting to grips with the functionality of the LMS, and makes it feel incredibly familiar. This is the mark of a great UI, as the user is able to interact immediately with the LMS, without any graphical interference in this process. Enable’s is also designed with mobile devices in mind. This means that the UI retains all of its features and functionality when resized between different screen sizes. By using a simple and colourful design, Virtual College have managed to maintain an intuitive consistency between devices so that a user who can use Enable on one device can use it on any device. Enable’s UI is intuitive because it uses a familiar and straight-forward menu structure, which is consistent throughout the entire system. This menu is always present on the left-hand side of the screen and allows the learner to easily navigate to any area with a single click. This means that a learner can engage in any activity without the need for time-consuming and confusing page navigation, as well as giving the learner the confidence that they know where every feature is. This menu is present in both the learner’s user interface, and the administrator’s user interface. The selection of actions is changes appropriately to the user’s privileges, but the menu structure remains the same, making changing between roles seamless. The thing that makes Enable really intuitive to me is that the bigger the tile, the more relevant it is. 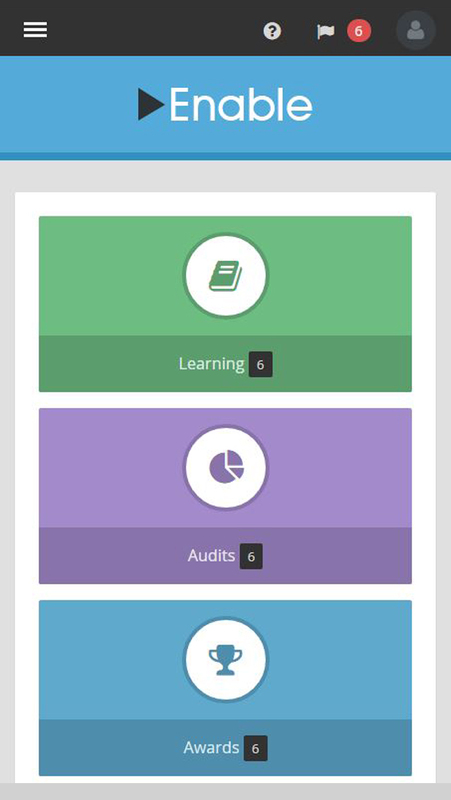 For example, when I’m on the dashboard, the actions most relevant to the screen I have selected are the largest – Learning, Audits etc., whilst the menu icons that navigate me away from the page are smaller. When I navigate to the Learning screen, the focal point becomes my available elearning courses. This is a simple but extremely effective point of design, and it means that a user is always drawn to the action they are most likely to require, making learner-LMS interaction intuitive. Enable’s user interface is the best LMS user interface that Learning Light have seen to date. It is immediately eye-catching and inviting, and it is the combination of it being simple, attractive and intuitive that makes learner-LMS interaction so easy. 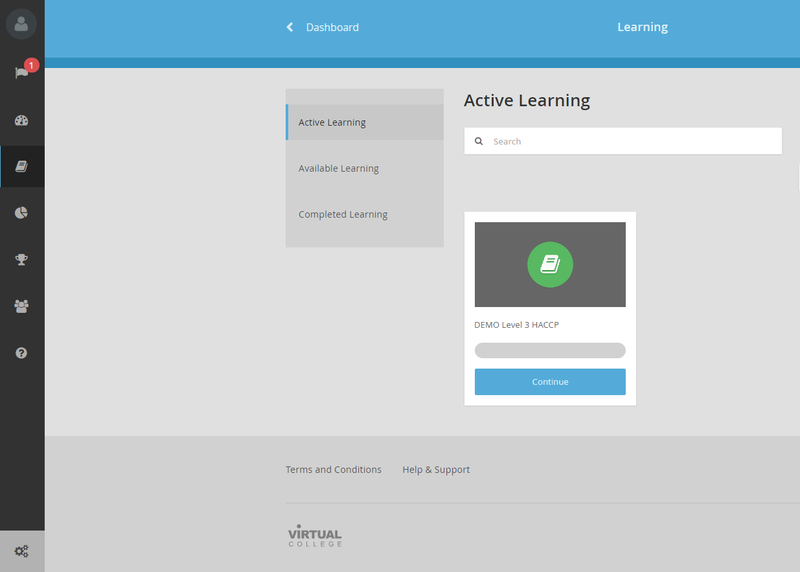 Easy learner-LMS interaction is the holy grail of LMS UI, so it is impressive that Virtual College have achieved this by concentrating on, developing and enhancing Enable’s most important interface features. You can also read our full review of Enable here.